Split Multipage PDF to single page PDF. Split PDF files by given page number intervals. Remove or extract pages from PDF. 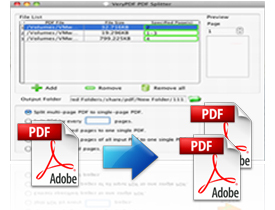 PDF Splitter for Mac is a powerful application which can be used to split, combine or delete PDF pages. It is an only Mas OS X oriented and supported application which supports to split the whole PDF file into singe pages or by every number of pages. It also allows users to split a batch of PDF documents and join the specified split pages together in a short time. With a user-friendly interface, you can quickly and easily master how to use PDF Splitter for Mac. Mac OS X: v 10.5, 10.6, 10.7, etc. PDF Splitter for Mac is able to split PDF document by setting page number interval so that you can create new PDF documents with every number of pages. The smaller the number interval you set, the more PDF documents you will get. By using PDF Splitter for Mac, you can easily extract the specified page of PDF document and save it in an output folder alone. In addition, PDF Splitter for Mac also supports to remove the specified page from the original PDF document if you don't need this page in your PDF document. PDF Splitter for Mac supports to make batch process easily and quickly. You can use it to extract a batch of PDF documents into single pages, extract specified page of a batch of PDF and combine them together, remove specified page of a batch of PDF documents, etc. Allow to drag and drop PDF when adding files. Enable to preview each page of input PDF. Support splitting multi-page PDF into single pages. Split PDF files by given page number interval. Support to split specified PDF page. 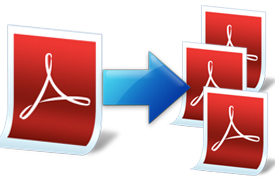 Allow to combine all split pages of batch PDF documents together. Support removing specified page of PDF document.